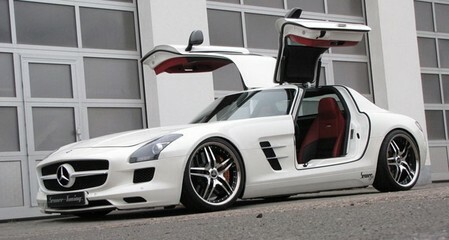 The latest tuning package for the Mercedes SLS comes from the German Senner tuning. And it’s a good one all around. The package does not include a body kit, but the visuals are drastically improved with a set of Corniche Vegas stainless steel rims, measutring at 9×20 inch rims with 255/30R20 tires at the front and 11×20 inch rims and 285/30R20 tires at the rear. The effect of wheels are perfected thanks to the Kw adjustable suspension which in its lowest setting give the SLS a killer look. The engine is also mildly modified with a new exhausts system and high performance air intakes to make an extra 30 hp in addition to its standard 570 hp.